The Simpson Strong-Tie® Strong Frame two-story ordinary moment frame enables Designers to reach new heights – and widths – in creativity. Accommodating openings up to 18' tall per story and 24' wide, the two-story ordinary moment frame is the ideal solution for projects featuring tall ceilings, expansive windows and other customized designs with space constraints or load requirements that exceed other lateral-force-resisting options for traditional light-frame construction. Unlike field-built ordinary moment frames – which are time-intensive to design and labor-intensive to install – the Strong Frame two-story ordinary moment frame is manufactured with the same value-engineering as our single-story Strong Frame moment frame, making it a cost-effective alternative to traditional frames. And our quick turnaround time in delivering your customized frame means no interruptions in the project construction schedule. Columns and beams accommodate designs with clear opening widths up to 24' and clear opening heights up to 18' per story. Because no field welding is required, frames install faster. No need to have a welder, or welding inspector, on site. A standard socket or spud wrench is all that is typically needed to make the connection. However, a heavy-duty socket wrench power tool may be necessary if fully tensioned bolts are required. Eliminate the need to drill and bolt nailers in the field. 11/16" diameter holes in the flanges and 3" holes in the column webs allow easy installation of electrical wiring and plumbing. Frames are manufactured in a production environment with comprehensive quality-control measures. Field-bolted connections eliminate questions about the quality of field welds. Direct-tension-indicator washers included. Disassembled frames are more compact, allowing for easier shipping and fewer deliveries. 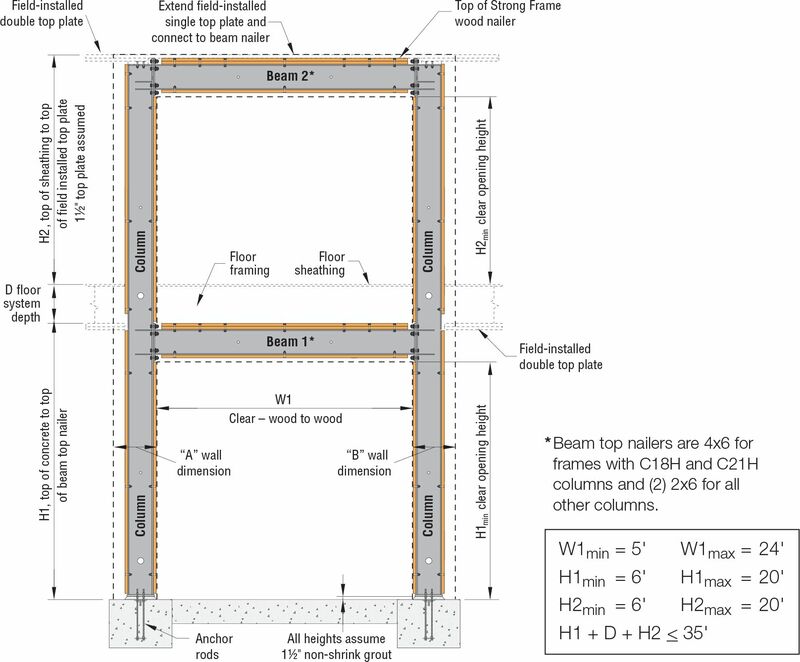 C18H and C21H columns require B12H, B16H or B19H beams. H denotes members with 1" connection bolts, 3/4" anchor bolts, 4x6 top nailers and (2) 2x6 inside nailers, and thicker end plates. To support the design of the Strong Frame two-story ordinary moment frame, the Strong Frame Selector software is available for download. Simpson Strong-Tie® Strong Frame Selector software is designed to help Designers select an appropriate frame for your project’s given geometry and loading. You need only key in minimum input for the software to select a suitable frame for the available space. Based on input geometry and loading the Strong Frame Selector software will return a list of possible solutions, sorted by frame weight. Designers can quickly design the two-story frames, with easy-to-read output that can then be sent to an authorized Simpson Strong-Tie dealer for a quote. 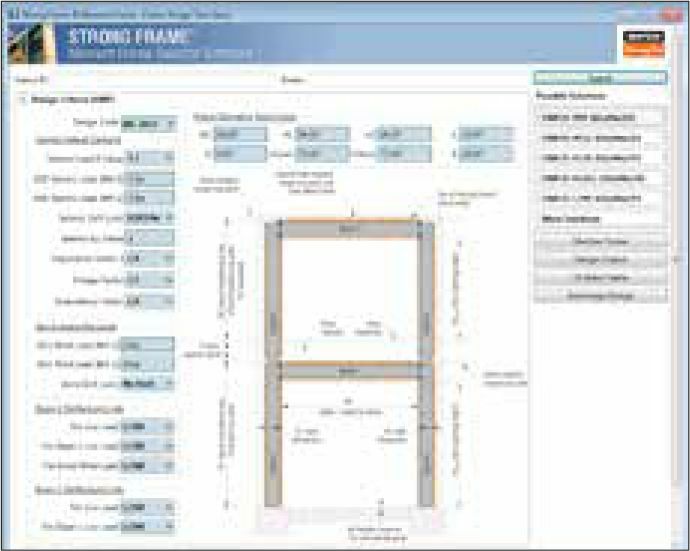 In addition to the two-story frame designs, the Strong Frame Selector software offers anchorage solutions for all frames. 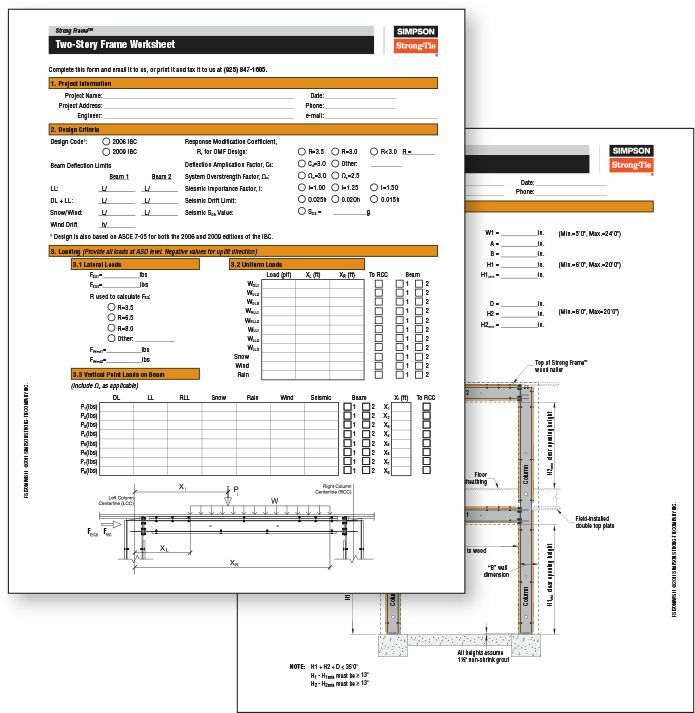 As an alternative to downloading the Strong Frame Selector software, Designers can key project-specific information into an electronic worksheet and either email it or fax it to our design engineers who will identify the two-story frame(s) appropriate for your project. For other design options, please visit our website or call your local Simpson Strong-Tie representative.